If you've read the Bible, you probably know some of the important battles, a good chunk of the life of Jesus, maybe a Psalm or two - but what do you know about the minor prophets and the epistles? Do you have some loose ends that need tying up? This is where a book like this helps. The Bible has one author - God - so we need to see the Bible as a whole, as God's Word. Every book of the Bible is the breath of God and the plan of Salvation spans all of Scripture. 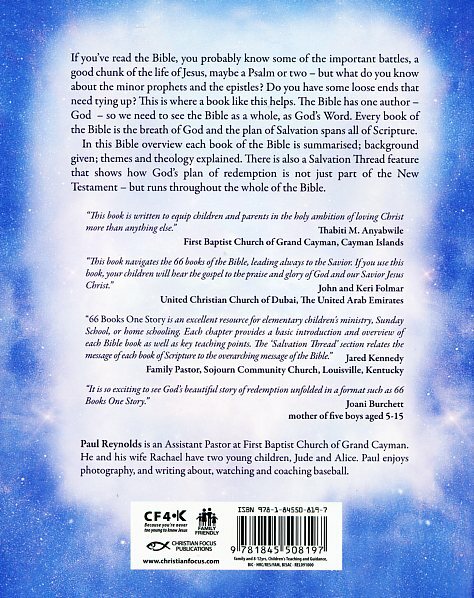 In this Bible overview each book of the Bible is summarised; background given; themes and theology explained. 66 Books One Story by Paul Reynolds was published by Christian Focus Publications in January 2013 and is our 18956th best seller. The ISBN for 66 Books One Story is 9781845508197. Be the first to review 66 Books One Story! Got a question? No problem! Just click here to ask us about 66 Books One Story. 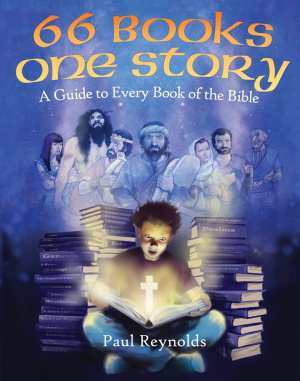 "66 Books, 1 Story is an excellent teaching and reference resource for elementary children's ministry,Sunday School, or home schooling. Each chapter provides a basic introduction and overview of each Bible book as well as key teaching points. The "Salvation Thread" section relates the message of the book to the overarching message of the Bible. I'm thankful for such a well-written resource that will provide an excellent supplement both for teaching and family devotions." - Jared Kennedy ~ Family Pastor, Sojourn Community Church in Louisville, Kentucky. "This book is written to equip both children and their parents in this holy ambition of knowing Christ better and loving Christ more than anything else we know and love in this world." - Thabiti Anyabwile ~ Pastor, First Baptist Church, Grand Cayman, Cayman Islands. Paul Reynolds is an Assistant Pastor at First Baptist Church of Grand Cayman. He and his wife Rachael have two young children, Jude and Alice. Paul enjoys photography, and writing about, watching and coaching baseball.